Rem Koolhaas, or rather, the continuously jetlagged avant-gardist. His image has always been that of an architect who is not entrenched in his own discipline but who uses architecture as a base to carry out raids on the whole culture. His work is a non-stop running commentary on la condition contemporaine and its impact both on architecture and on our ideas. His work is distinctly conceptual, and contains hidden intellectual depths. He is not afraid of reformulating a given project in terms of a strategy that undermines outworn conventions. His work is a stumbling block, literally and metaphorically. OMA is not a company that deals in amenities, but a place where the future of our culture is discussed. It seems almost incidental that architecture and city-planning are the media employed. With his inimitable mix of paradoxical statements and spectacular objects and images, Koolhaas is an architect who has transgressed the limits of his specialism and has made inroads into the realms of economy, philosophy and art. In 1990, for instance, he participated in the huge exhibition, Energies, in the Stedelijk Museum in Amsterdam. His competition entry for the Très Grande Bibliothèque in Paris was shown there alongside the work of artists such as Bruce Nauman and Anselm Kiefer. 'the interfusion of crowds of people among a high technological bazaar with its multitudinal nodal points, all of this scaled into an inside without an outside, which thereby intensifies the formerly urban to the point of becoming the unmappable system of late capitalism itself: the abstract system and its interrelations are now the outside, the former dome, the former city, beyond which no subject position is available, so that it cannot be inspected as a thing in its own right, although it is a totality'. It is clear that this architecture has a distinct psychopathological dimension. The city of the Fascinists has ceased to be a forum where public affairs can be debated; what it offers is the kick of a psychic dance on the edge of the abyss. 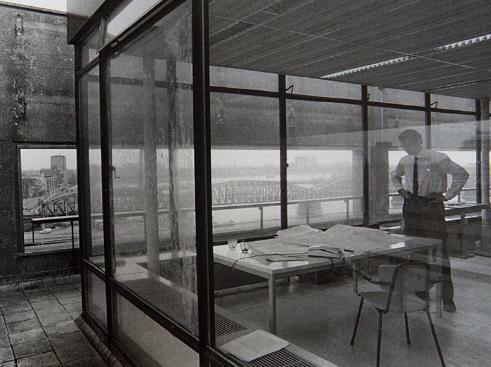 Koolhaas' only objective to date, according to Jameson, has been 'to model what is no longer a public sphere or realm but rather a no man's land'. 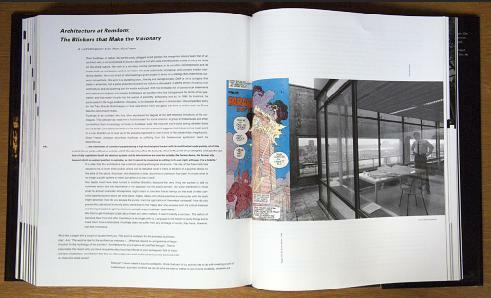 Our heads must have been turned in another direction, because the very thing we wanted to talk to Koolhaas about was the importance of his approach for the public domain. We were interested to know what his almost cinematic atmospheres might mean to concrete human beings on the level of their concrete experience and above all what plans, hopes, ideas and critical potential an encounter with his work might generate. How do you escape the purely practical application of theoretical concepts? How do you prevent this adventure from only being interesting to the 'happy few' who possess both the critical distance and the liquid assets to get the chance to actually enjoy Koolhaas' hyperreality?